The Niigata Chuetsu earth-quake caused large-scale destruction. 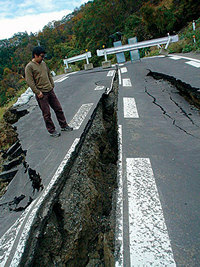 A powerful earthquake with a magnitude of 6.8 shook the Chuetsu region of Japan's Niigata prefecture on October 23, 2004. The Niigata Chuetsu earthquake, named after the location of the epicenter, became the largest disaster in terms of scale and impact since the 1995 Great Hanshin-Awaji (Kobe) earthquake. The earthquake caused large-scale destruction of properties in the region, particularly affecting older structures, and resulted in 46 deaths, 4,793 injuries, and the evacuation of more than 100,000 residents from their homes. Among the municipalities affected, the city of Ojiya (population: 41,461; households: 12,266) suffered the severest damage as it was closest to the epicenter. 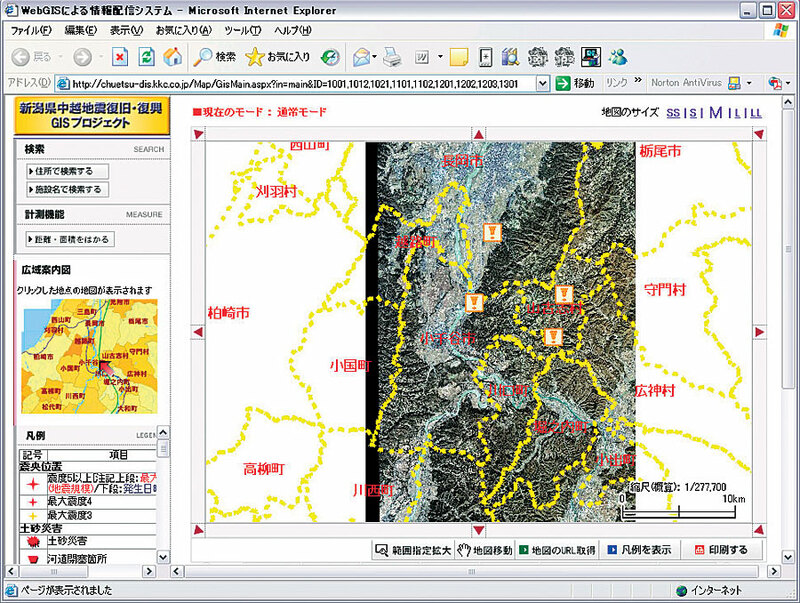 Soon after the earthquake occurred, professor Haruo Hayashi from the Disaster Prevention Research Institute of Kyoto University and his research team helped develop three GIS applications that were important contributions to the disaster response. These applications were a GIS portal site for quickly sharing disaster-related GIS data, an efficient method of accessing and recording damage in the field throughout the city, and customized GIS systems to speed up the issuance of damage certificates. More than 40 key organizations joined the project to build an Internet GIS site (chuetsu-gis.nagaoka-id.ac.jp) to provide valuable information and maps. This GIS portal project had great significance because it gathered various organizations from the national, local, educational, and private domains together and built a framework in which geographic information could be shared in real time to support disaster response activities. The establishment of the project initiated a foundation that would be carried on and utilized in future disaster events. The goal was to build an Internet GIS site so organizations involved in postdisaster events, most of them scattered throughout the country, could readily upload and/or download GIS data. The team, along with Esri Japan Corporation, developed the site (www.geographynetwork.ne.jp/ disasters/explorer.jsp) based on the Japanese version of Esri's Geography Network. Because of the adoption of the Geography Network framework, the team was able to build the site in less than 10 days and could easily start providing data many organizations were anxious to get. Hayashi's research team had been in the city of Ojiya since the day after the earthquake occurred and was asked to help conduct damage assessments because the team had done extensive research in the past on structural damage assessment processes. Evaluation results of the damage assessments were recorded on paper survey sheets, but to streamline the data entry process and increase data accuracy, ArcPad PDA applications were also developed following the same procedures used in the manual process. The results are calculated automatically and entered on-site, avoiding errors associated with manual data entry (miscalculation, etc.). Also, the assessment results are properly linked to the corresponding buildings. One of the biggest issues the team had to resolve in developing the database for damage certificates was the large number of mismatches that occurred between the results and building polygons. This problem arose mainly because a parcel with a single address would often contain multiple buildings (house, garage, warehouse, workshop, etc. ), and it was difficult to identify the correct building for the assessment once the survey was completed. However, once the team began using the ArcPad PDA solution, it didn't have such problems because the results were entered into the correct polygon at the time of the assessment. A great number of investigators were out-of-town volunteers and not familiar with the city. Furthermore, they often had to go to places where there were neither street signs nor nameplates. However, the PDAs with GPS devices attached allowed ArcPad to automatically zoom in to the point so the investigators knew exactly where they were. Damage certificates are issued to victims of a disaster to officially acknowledge their losses. These certificates determine eligibility for receiving various kinds of relief measures, such as distribution of relief money, tax exemptions, and a reduction on their national health insurance premiums, so it was important to process the assessment results as quickly and correctly as possible. Customized applications for issuing damage certificates. Early on, it was decided to digitize the assessment results from paper survey sheets into a database where the information could be managed and retrieved accurately and efficiently. Once the base datasets were prepared, the damage assessment results were linked to the building footprints of the Property Tax layer, and photographs of the damage were linked to the building polygons. Once the database was built and ready to be deployed, several customized ArcGIS applications were developed to streamline the process of issuing damage certificates. The goal was to build a GIS database system that would improve the efficiency of the distribution process so that the city could issue as many damage certificates as possible while simultaneously providing satisfactory services to disaster victims. Develop the applications based on the specific needs of the damage so city personnel can perform their tasks effectively. Design a user interface that is as simple as possible so city personnel can access the necessary functions as quickly as possible (ArcObjects was used for customization), since most city personnel had never used GIS before. Make the system as simple as possible. The team was given less than one week to develop the whole system, so it was particularly important to make the development work uncomplicated. It was also important to make the system straightforward and trouble free so the tasks could be carried out successfully. It was essential to develop the system on a server/client configuration so the same information could be shared among everyone, and any edits that were made could be reflected in real time (ArcEditor, ArcSDE, and Oracle9i were used to support this). The Property Tax Department started issuing damage certificates on November 21, 2004, and more than 3,200 certificateswhich amounted to one-quarter of the households in the city of Ojiyawere issued during the first four days without any disruption. Most of the Property Tax Department personnel, as well as supporters from adjacent cities, had never used GIS before, but all of them were able to use the system with less than one-half hour of training and were completely comfortable in using GIS to process their work. The GIS system certainly played an important role in producing damage certificates. Without it, the city of Ojiya could not have achieved as much as it did in such a short time. Damage certificates were issued for a full year, proving that the system is stable. The project indeed demonstrated the value of utilizing GIS technologies in emergency response and illustrated the importance of data integration. For more information, contact Paul Yoshitomi, Disaster Prevention Research Institute, Kyoto University (e-mail: paul@drs.dpri.kyoto-u.ac.jp, tel. : 81-774-38-4283), or visit Kyoto University's Web site (www.drs.dpri.kyoto-u.ac.jp/top.html).